We’ve received your request for the free download. Thank you for signing up and be sure to confirm your email in your inbox. You’ll receive your free download of the Death & Dying Checklist via email after a few minutes. 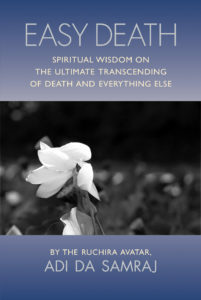 Get direct access to the source of the wisdom found in your Death & Dying Checklist — the Easy Death book! Use promotional code EASY25 at checkout to get 25% off the purchase of the book Easy Death, by Adi Da Samraj.